Holy Martyr Jacinthus (Hyacinth) Commemorated July 3. It is all because of holiness.. It is all because of holiness. The Holy Martyr Jacinthus (Hyacinth), a native of Caesarea Cappadocia, grew up in a Christian family. The Roman emperor Trajan made him his "cubicularius" (bed-chamberlain). Once during the time of a pagan festival the emperor Trajan was feasting in a pagan-temple together with his companions, eating of the idol-offered food, but the youth Jacinthus, having remained at the palace, shut himself up in a small room and prayed fervently to the Lord Jesus Christ. One of the servants overheard the words of prayer. He made a denunciation to the emperor, that Jacinthus, entrusted with an imperial position, did not honour the Roman gods but was secretly praying to Christ. They immediately arrested Saint Jacinthus and led him to Trajan. The emperor demanded that he eat of the idol-offered meat, but the saint bravely refused and declared himself a Christian. By order of Trajan, they locked up the holy martyr in prison after fierce tortures, and they exhausted him with hunger and thirst, so as to force him to eat of idolatrous food. On the 38th day, one of the guards, bringing the idol-offering meat, saw Angels alongside the martyr, dressing him in bright attire and placing on his head a crown. The torturers decided to continue with the trial over the saint, but they found him in prison already dead. The twelve year old Jacinthus died in the year 108 in the city of Rome. They afterwards transferred the relics of the saint to Caesarea. I read the lives of the Saints to inspire me and to show what I am not and what I should be. Who cannot be inspired by the super-human bravery of a TWELVE YEAR OLD BOY? When I read the lives of the Saints, I often have a “question” in my mind – how could a person do such a thing – have such bravery, endurance, humility, chastity, etc? The answer is always the same – holiness. Or more properly, the ABSOLUTE, UNCOMPROMISING pursuit of holiness. Would I have the courage to pray secretly when I knew being discovered would mean a terrible (in earthly terms) death? Yes, if I had faith and was holy. Would I endure in my faith when spending long periods of absolute solitude and starvation in between periods of torture? It would be very easy to stop the tortures, and I think, impossible no to unless there was the great grace of holiness in my soul. Hyacinth clearly was holy. He had a secular job with many duties, but somehow he was able to fulfill his absolute destiny which we also have – to become holy. With rays of grace thou dost shine to the ends of the world,/ like a hyacinth in Christ's Church, O blessed Hyacinth;/ for thy confession of the Faith was radiant;/ and in thy contest thou didst follow Christ the Word./ Thou dost ever illumine those who honour thee. Come O you faithful, plait a crown of unfading hyacinths today/ for the Martyr Hyacinth, and let us cry to him:/ Rejoice, O Hyacinth, glory of the martyrs. Blog posts & local parish news are posted to our email list. 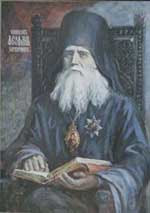 Go to here: http://groups.google.com/group/saint-nicholas-orthodox-church to join. July 3 on the church calendar corresponds to July 16th on the secular calendar. In Byzantium, they played a very important role, holding senior palace offices such as parakoimōmenos or the epi tēs trapezēs, but also served in posts in the central financial departments, as provincial administrators and sometimes even as generals…. Today we celebrate St Theophan the Recluse. His was a unique ministry – a “recluse” who communicated with hundreds of people regularly via letters. We are fortunate to have many of his letters, evidently saved by his correspondents. In addition, this “modern” Saint wrote many excellent books, all of which were steeped in the wisdom of the Fathers, expressed in way easy to understand by the modern man. For many parts of his life, St Theophan saw almost no human faces, but he shows an incredible insight into human nature and the troubles of modern life. It is well worth it to pick up ANY book written by him and read it. Here are a few pithy quotes, in no particular order. Everywhere and always God is with us, near to us and in us. But we are not always with Him, since we do not remember Him; and because we do not remember Him we allow ourselves many things which we would not permit if we did remember. Take upon yourself this task — to make a habit of such recollection. Make yourself a rule always to be with the Lord, keeping your mind in your heart, and do not let your thoughts wander; as often as they stray, turn them back again and keep them at home in the closet of your heart, and delight in converse with the Lord. It is well known how powerfully corrupt images act upon the soul, no matter in what form they may touch it! How unfortunate is the child who, closing his eyes, or being left alone and going within himself, is stifled by a multitude of improper images — vain, tempting, breathing of the passions. This is the same thing for the soul as smoke is for the head. The Spiritual Life and how to be attuned to it. This week was the last part of the “twelve days of Christmas”, with The Eve of Theophany on Friday, Jan 5/18, and Theophany the next day, on Saturday. I hope you enjoyed the fast free period. As I have told you before, we have a unique opportunity as Orthodox Christians who follow the fasts. When a period is fast free, we certainly notice it, and even our “not fasting” will remind us of God. Those in the world who do not fast have no reason to particularly notice how delicious certain foods are. What Happened? A short review of last week. Monday, Jan 1/14 was the Feast of the Circumcision and St Basil the Great. This was the namesday of Vasyl Hurt and Vasily Newell. Tuesday, Jan 2/15 we held Vespers and discussed afterwards the Troparion and Kontakion for the feast of Theophany and its prefestival. The session is worth a listen and can be found at http://feeds.feedburner.com/OrthodoxChristianCatecheticalTalks. On this page, you may listen to and subscribe to the latest catechetical talks at St Nicholas. All catechetical talks are available at http://www.orthodox.net/catechism. This day was also the date of the commemoration of St Seraphim of Sarov, my patron. I was also able to visit five men in prison; I am visiting them twice a month. I have baptised two: Demetrius and John, and two others, Robert and Williiam, will become catechumens soon. Wednesday Jan 3/16 we had Divine Liturgy, at its regular time of 9 AM (see the front page for our Wednesday liturgy schedule, this one, being the 3rd Wednesday of the month, is always at 9AM and led by Jelena. Most of the hymns were in Slavonic, with very beautiful Serbian melodies. I consider Serbian melodies to be in between Greek and Russian (sounding somewhat like each), and our parish is fortunate to have such variety in our sacred music. I am also pleased to announce that we have had EXPONENTIAL GROWTH in our weekday liturgy attendence, which has DOUBLED in 1 week (from 2 to 4!). Perhaps we will have eight at the next liturgy? Friday, Jan 5/18 was the Eve of Theophany, and at 7 AM we celebrated the Hours, Typika, Vespral Divine Liturgy of Basil the Great, and first Great Blessing of the Waters. I would dearly love to talk to you all sometime about the OT and NT readings – all about water in some fashion. Saturday, Jan 6/19 is THEOPHANY. Divine Liturgy at 10AM, followed by the Great Blessing of the Waters. Sunday, Jan 7/20 is the Sunday after Theophan, and the Synaxis of The Prophet, Forerunner and Baptist John. A past audio homily for this day can be found at http://www.orthodox.net/sermons/feasts-of-the-savior-theophany-04_2003.mp3. Tuesday Jan 8/21 we will have Vespers at 6:30 PM, followed by another talk about some aspect of the church’s prayer. I keep making up each weeks teaching the week before, and would like to get a schedule out, to have at least a little organization. We will be talking about the church’s prayer for a while yet, and I am open to topics. If you have something you want me to talk about, please let me know. Wednesday, Jan 9/22 we will have Divine Liturgy at 9 AM. Riassa will be the main reader. and protectress of Paris, O Mother Genevieve. MANY YEARS TO GENEVIEVE PARK ON HER NAMESDAY! We do not know of a source for St Geneevieve’s troparion and kontakion in English, but here it is in French! Pour l’amour du Seigneur, Гґ sainte GeneviГЁve, tu as pris en haine le dГ©sir de repos, ayant Г©clairГ© ton esprit par le jeГ»ne, car tu as vaincu les bГЄtes avec force. Mais par tes priГЁres tu as Г©crasГ© l’agitation des ennemis. In France 500 years after Christ’s birth, there lived a shepherd girl with a blooming faith in her heart, the very same faith which budded in the hearts of the Judean shepherds who followed the star to the Lord’s manger- bed. Born into a wealthy family, the young Genevieve watched her family’s flock as a matter of custom rather than need. Their home was in ‘the lovely hill-country of Nanterre outside Paris. 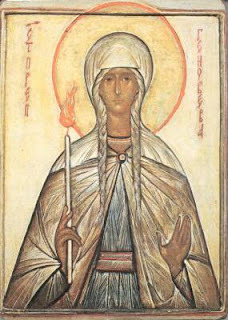 And in it Genevieve’s soul was nourished with the Gospel message, the icons which illumined it, and the example of her parents’ peaceful and pious lives. One day the holy Bishop Germanus came to Nanterre and the people flocked to him as to a living iconof Christ. As he blessed the crowd, his eye fell upon the child Genevieve; his heart recognized the flame of love for God in her and he knew God intended to crown it with Divine Grace and unshakable faith. He called her to him, kissed her head, and told her parents that many would come to Christ because of her. Then he asked her, quite seriously, if she wished to dedicate her whole life to Christ, as a bride. And just as seriously little Genevieve replied that he had spoken exactly the desire of her heart. They entered the church for Vespers together and the Bishop rested his hand on her head until the end of the service. The next morning the holy Bishop presented her with a medallion engraved with a cross and asked her never to wear another ornament but the Ornament of God’s Grace through the Holy Spirit. With that, he gave his blessing to the townspeople and left Nanterre.At fifteen Genevieve was consecrated to the monastic life. When her parents died she went to live in a monastic community in Paris. The Evil One wasted no time in stirring up words against her, but the kindly Bishop Germanus treated her warmly in the sight of all and spoiled the Devil’s plan to be rid of her quickly. For the rest of her life the people of Paris wavered in their loyalty to her. One month they brought their sick to her for prayers and glorified God when their loved ones recovered. The next month the Wicked One sowed little seeds of evil in their ears and thoughts and they wanted to stone her. To his dying day her friend the Bishop stuck by her and even from his deathbed sent a message where- by she found favor with the people once again. As a reward for their repentance and because of Genevieve’s heartfelt prayers and fastings with her sisters, God turned away an invading army and spared the city of Paris. In her later life the Saint showed great compassion and steadfastness as Bishop Germanus had foretold. Once a pagan king, de siring to kill some prisoners, tried to do it before Genevieve could hear about it. He knew that if she begged for their lives he could not resist her pleas. But God told her about it and she rushed to the execution just in time to have the prisoners spared. People saw from this example that the prayers of this Saint must be very powerful before the king of Mercies is even a pagan king could not resist them. One night in a violent rainstorm, the only lantern of Genevieve and her sisters blew out in the pitch dark of the muddy woods. Our Saint signed the lamp with the Cross of the Lord and a bright flame crowned the candle lighting their way to early morning Liturgy. St. Genevieve reposed at a great age and her relics rest in the Church of St. Stephen in Paris, France. Today is the my namesday. St Seraphim is a lot to live up to. When I was baptised, a friend told me that I had one year to pray in the air and glow in the dark (both these things are described in the Saints conversation with Motovilov) Still waiting! I thought it a good idea to examine a couple of the Saints famous sayings. We could discuss a hundred, but I will keep it to two to make this post “digestable”. Let’s see what we can learn from them. Saint Seraphim treated EVERYONE equally, and called everybody “My joy”, or “Your godliness”. What an amazing point of view! He did not struggle to see the image of God in people as we do. Let’s admit it, when we see things that are contradictory to Christianity (or appear to be so) in people, we judge and the encounter with the person is unpleasant to us. He was not unaware of their sins; Saint Seraphim was clairivoyant, and yet the Saint did not struggle to see this image; because of his purity, he saw everyone AS CHRIST, and filled with love, called them “My joy”. It would be a salvific for us if everything we did was first prefaced by questioning thoughts influenced by the Saint’s words. Everything we do should have ONE purpose, which the saint outlines it clearly above. It is always easier to do something, and to endure when troubles begin, if one has a purpose. Sin is first conceived in the mind. There is a precious, small amount of time when our mind is considering a thought that we have an opportunity to accept it or reject it. Because of our weakness, after a certain point in the consideration of a sinful or unprofitable thought without outright rejection of it as sinful, we will be powerfully attracted to it, and unable to stop ourselves. It is during this precious time that we must bring all possible weapons to bear against our attraction to the sinful thought. Since thoughts are complex and the devil is wily, we cannot attempt to apply too much intellect to this struggle – we are over matched here. Simple thoughts must be our shield and sword against the darts of the Evil One. Based on the words of the Saint, we could use such simple thoughts as “will this thing help me acquire the Spirit of God, or will it hinder me”, or “Am I gathering or scattering”. O great Saint of God, our venerable and God-bearing Father, Seraphim! burdened with our many sins, and ask thy help and consolation. to make progress in Christian devotion and to be worthy of thy prayers before God. to inherit the bliss of heavenly mansions. for ages of ages. Amen. From an Akathist. “Polny Sbornik Molitv”, pp. 202-203. …to raise up the image that fell of old! The beautiful troparion of the Forefeast of Nativity sums up succinctly the purpose of the incarnation of the God-Man, Jesus Christ. One may say, it contains in full our вЂњtheology of redemptionвЂќ. Jesus Christ became man so that our image, which вЂњfell of oldвЂќ due to the sin of Adam and Eve, and the subsequent weakening of the human race might be вЂњraisedвЂќ. He did not come to вЂњpurchaseвЂќ our forgiveness by dying on the cross1 His primary mission was not to obtain forgiveness for us! If all Christ’s mission accomplished for us was that our sins are forgiven, we are truly to be lamented, because we will never be able to change. We would still be sinners, with our tempestuous passions, even if we be pardoned every day. What good is that? We were made in the image of God вЂ“ Who is perfectly holy, perfectly free, perfectly at peace. Our sins obscure this image, and make it less effectual in our lives, just as dirt makes pure water cloudy. The water retains all its properties, even though because of the pollution it is unfit to drink. The вЂњdirtвЂќ in our soul that obscures the image of God is our sins, our passions, and in general, our weakened human condition. вЂњRaising up the image that fell of oldвЂќ is like filtering the water, and removing that which is foreign to it. Can God’s grace raise up His image in us, obscured by sin and passions, merely by forgiveness? Absolutely not. Forgiveness does not remove sinfulness; it does not strengthen the human condition. Christ вЂњraised up the imageвЂќ (of God) in us precisely by showing us how to live, and enabling us to live in this way. His ministry was one of knowledge and power. His way of life and teachings shows us the only way to live, and by His power, upon resurrecting His human soul, he gave us the ability. The raising up of the image is performed by each of us, with struggle, always with the grace of God helping us. If we truly understand what the вЂњImage of GodвЂќ is then the need to labor to raise up this image will be plainly apparent. The image of God reflects His nature вЂ“ God is love, and He is pure, holy, full of knowledge, free. How can these things be understood if they are not lived? Once Mary, pregnant with a seedless pregnancy, / was registered in Bethlehem with the elder Joseph, / as being of the seed of David. / And while they were there, / the days were accomplished that she should be delivered, / but there was no room for them in the inn. / But the cave showed itself to be a beauteous palace for the Queen, / and Christ is born //to raise up the image that fell of old! Troparion of the Forefeast, sung in the Royal Hours for Nativity. 1this is the so called вЂњsubstitutionary atonement” taught by most Protestants ans Roman catholics, and alas, believed by some Orthodox who do not understand their own faith. This doctrine states that Jesus appeased His Father’s wrath by offering Himself as a perfect sacrifice. In essence, this doctrine states that God would NOT orgive us unless we killed His son! come to pass; he shall have whatsoever he saith. Therefore I say unto you, What things soever ye desire, when ye pray, believe that ye receive them, and ye shall have them." St. James appears to contradict this, pointing out what we all know from experience, that "Ye ask, and receive not, because ye ask amiss, that ye may consume it upon your lusts." This illustrates the nature of faith: true faith proceeds out of a pure heart, and a humble spirit. If we have faith, then we will have confidence that our requests will be granted because our requests will be in accordance with God's will. "God resisteth the proud, but giveth grace unto the humble." This also sheds light on yesterday's readings. Why is it that our Lord's words had such power – to the withering of the fig tree – while our own words seem so weak? As St. James points out, our words have great effect, but it is usually negative – because they come from our passionate hearts. "Can the fig tree, my brethren, bear olive berries? either a vine, figs? so can no fountain both yield salt water and fresh." When we allow our heart to be purified through the Grace of Christ, when we allow faith to dwell in our hearts, then our words will yield good fruit unto His glory. Doth a fountain send forth at the same place sweet water and bitter? of mercy and good fruits, without partiality, and without hypocrisy. And the fruit of righteousness is sown in peace of them that make peace. he saith, God resisteth the proud, but giveth grace unto the humble. neither will your Father which is in heaven forgive your trespasses. The Hieromartyr Ignatius the God-Bearer, was a disciple of the holy Apostle and Evangelist John the Theologian, as was also St Polycarp, Bishop of Smyrna (February 23). 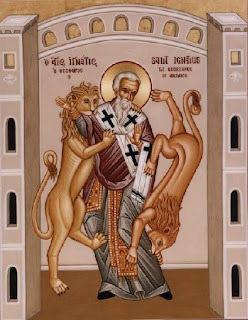 St Ignatius was the second bishop of Antioch, and successor to Bishop Euodius, Apostle of the Seventy (September 7). Tradition suggests that when St Ignatius was a little boy, the Savior hugged him and said: “Unless you turn and become as little children, you shall not enter into the Kingdom of Heaven” (Mt. 18:3). The saint was called “God-Bearer” (Theophoros), because he bore God in his heart and prayed unceasingly to Him. He also had this name because he was held in the arms of Christ, the incarnate Son of God. St Ignatius was a disciple of the Apostle John the Theologian, together with St Polycarp of Smyrna. As Bishop of Antioch, St Ignatius was zealous and spared no effort to build up the church of Christ. To him is attributed the practice of antiphonal singing (by two choirs) during church services. He had seen a vision of the angels in heaven alternately singing praises to God, and divided his church choir to follow this example. In the time of persecution he was a source of strength to the souls of his flock, and was eager to suffer for Christ. In the year 106 the emperor Trajan (98-117), after his victory over the Scythians, ordered everyone to give thanks to the pagan gods, and to put to death any Christians who refused to worship the idols. In the year 107, Trajan happened to pass through Antioch. Here they told him that Bishop Ignatius openly confessed Christ, and taught people to scorn riches, to lead a virtuous life, and preserve their virginity. St Ignatius came voluntarily before the emperor, so as to avert persecution of the Christians in Antioch. St Ignatius rejected the persistent requests of the emperor Trajan to sacrifice to the idols. The emperor then decided to send him to Rome to be thrown to the wild beasts. St Ignatius joyfully accepted the sentence imposed upon him. His readiness for martyrdom was attested to by eyewitnesses, who accompanied St Ignatius from Antioch to Rome. From Smyrna, St Ignatius went to Troas. Here he heard the happy news of the end of the persecution against Christians in Antioch. From Troas, St Ignatius sailed to Neapolis (in Macedonia) and then to Philippi. On the way to Rome St Ignatius visited several churches, teaching and guiding the Christians there. He also wrote seven epistles: to the churches of Ephesus, Magnesia, Tralles, Rome, Philadelphia, and Smyrna. He also addressed a letter to St Polycarp, who mentions a collection of the letters of St Ignatius in his letter to the Philippians (Ch. 13). St Irenaeus of Lyons quotes from St Ignatius’s letter to the Romans (AGAINST HERESIES 5:28:4). All these letters have survived to the present day. The Roman Christians met St Ignatius with great joy and profound sorrow. Some of them hoped to prevent his execution, but St Ignatius implored them not to do this. Kneeling down, he prayed together with the believers for the Church, for love between the brethren, and for an end to the persecution against Christians. After this the lions were released and tore him to pieces, leaving only his heart and a few bones. Tradition says that on his way to execution, St Ignatius unceasingly repeated the name of Jesus Christ. When they asked him why he was doing this, St Ignatius answered that this Name was written in his heart, and that he confessed with his lips Him Whom he always carried within. When the saint was devoured by the lions, his heart was not touched. When they cut open the heart, the pagans saw an inscription in gold letters: “Jesus Christ.” After his execution St Ignatius appeared to many of the faithful in their sleep to comfort them, and some saw him at prayer for the city of Rome. Hearing of the saint’s great courage, Trajan thought well of him and stopped the persecution against the Christians. The relics of St Ignatius were transferred to Antioch (January 29), and on February 1, 637 were returned to Rome and placed in the church of San Clemente. From a post of John Tsapos to the Yahoo groups вЂњCatechismвЂќ mailing list. I do not issue orders to you, as if I were some great person. For though I am bound for the name [of Christ], I am not yet perfect in Jesus Christ. For now I begin to be a disciple, and I speak to you as fellow-disciples with me. For it was needful for me to have been stirred up by you in faith, exhortation, patience, and long-suffering. But inasmuch as love suffers me not to be silent in regard to you, I have therefore taken upon me first to exhort you that ye would all run together in accordance with the will of God. Letter to the Ephesians, Chapter III.вЂ”Exhortations to unity. For some are in the habit of carrying about the name [of Jesus Christ] in wicked guile, while yet they practise things unworthy of God, whom ye must flee as ye would wild beasts. For they are ravening dogs, who bite secretly, against whom ye must be on your guard, inasmuch as they are men who can scarcely be cured. There is one Physician who is possessed both of flesh and spirit; both made and not made; God existing in flesh; true life in death; both of Mary and of God; first passible and then impassible, even Jesus Christ our Lord. Letter to the Ephesians, Chapter VII.вЂ”Beware of false teachers. Letter to the Ephesians, Chapter XIII.вЂ”Exhortation to meet together frequently for the worship of God. I write to all the Churches, and impress on them all, that I shall willingly die for God, unless ye hinder me. I beseech of you not to show an unseasonable good-will towards me. Suffer me to become food for the wild beasts, through whose instrumentality it will be granted me to attain to God. I am the wheat of God, and am ground by the teeth of the wild beasts, that I may be found the pure bread of God. Rather entice the wild beasts, that they may become my tomb, and may leave nothing of my body; so that when I have fallen asleep [in death], I may not be found troublesome to any one. Then shall I be a true disciple of Jesus Christ, when the world shall not see so much as my body. Entreat the Lord for me, that by these instruments  I may be found a sacrifice to God. I do not, as Peter and Paul, issue commandments unto you. They were apostles of Jesus Christ, but I am the very least [of believers]: they were free,  as the servants of God; while I am, even until now, a servant. But when I suffer, I shall be the freed-man of Jesus Christ, and shall rise again emancipated in Him. And now, being in bonds for Him, I learn not to desire anything worldly or vain. The Epistle of Ignatius to the Romans, Chapter IV.–Allow me to fall a prey to the wild beasts. All the ends of the world, and all the kingdoms of this earth,  shall profit me nothing. It is better for me to die for the sake of Jesus Christ, than to reign over all the ends of the earth. “For what is a man profited, if he gain the whole world, but lose his own soul?” I long after the Lord, the Son of the true God and Father, even Jesus Christ. Him I seek, who died for us and rose again. Pardon me, brethren: do not hinder me in attaining to life; for Jesus is the life of believers. Do not wish to keep me in a state of death,  for life without Christ is death. While I desire to belong to God, do not ye give me over to the world. Suffer me to obtain pure light: when I have gone thither, I shall indeed be a man of God. Permit me to be an imitator of the passion of Christ, my God. If any one has Him within himself, let him consider what I desire, and let him have sympathy with me, as knowing how I am straitened. The Epistle of Ignatius to the Romans,Chapter VI.–By death I shall attain true life. On December 13/26, we celebrate the memory of the Holy Martyr LUCY. MANY YEARS TO Lucy (Lulu, Ludy Goose) Park! With her mother, Lucy visited the grave of St. Agatha in Catania, where St. Agatha appeared to her. Her mother, who had dropsy, was then miraculously healed in the church. Lucy distributed all her goods to the poor, and this embittered her betrothed, who accused her of being a Christian before Paschasius the judge. The wicked judge ordered that she be taken to a brothel in order to defile her. However, by the power of God she remained immovable, as if rooted to the earth, and not even a multitude of people was able to move her from that spot. Then an enraged pagan pierced her throat with a sword and she gave up her soul to God and took up her habitation in the Kingdom of Eternity. Lucy suffered in the year 304. Ikos: Waiting for the divine Word to come for her, like the wise virgins Lucy filled the lamp of her soul with oil most rich; for having sold all her property, she bestowed all her substance upon the poor and destitute. Wherefore, feeding the hungry and giving drink to those athirst, clothing the naked and providing shelter for the indigent, she laid up for herself great store of the oil of mercy, wherewith to delight her Master. For this cause, let us sinners entreat her with boldness, that she pour forth of her oil and wine upon our manifold wounds, treating the afflictions of our bodies and curing the passions of our souls, that, restored to full health by her, we also may abide eternally with the heavenly Bridegroom. Same text as the Prologue, above. Menaion:December 13/26 – The "Five Companions"
On December 13, (Dec 26 on the civil calendar) we celebrate the memory of the “Five Companions”, MARTYRS EUSTRATIOS, AUXENTIOS, EUGENE, MARDARIUS AND ORESTES (+ C. 284-305). Their story is included below, as well as some useful links. Our prayers in the church come from many sources, all of which, of course, feed from the same ultimate source – The Holy Spirit. Today, let us consider the Prayer at the end of the First Hour. It was said by St Mardarius just before he died, and was recorded by an eye witness, and made its way into our daily prayers. for blessed art Thou unto the ages of ages. Amen. Having this prayer “in context” should make it infinitely more meaningful for us. Here is a prayer of complete submission to, and hope in God: the last words of a man! The entire angelic host must have been awed at the spectacle! Here was a man, bloodied and about to breathe his last, ending his heroic struggle, and yet his prayer was one filled with humility and hope in in the Triune God! We believe that the martyrs are especially beloved by God, and pass from this life to the next without fear or travail, and yet, Mardarius, filled with the power of God, and certainly, also the confidence that God gives to his humble strugglers, chose to make his last words on earth those of a simple, humble man, aware of his own great sins, and God’s perfect beneficence. We should wonder, what would our words be in such a case? Would we remain calm, humble, assured of God’s perfect plan for us, or would we be in terrible fear and pain, or even worse, feel some sense of entitlement because of our struggles? 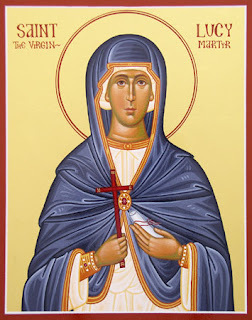 The holy Martyr Mardarius offers us a perfect way to pray, and to live, and to die. Please consider adding this prayer to your daily rule. All of us are dying; let us die like the great Mardarius, ever with the knowledge of our own sinfulness, with complete submisison to God’s perfect love for us. Holy Mardarius! We have endured none of thy struggles, and yet we possess none of thy humility, we the great sinners, who do not remember our sinfulness. Thou didst offer thy blood to God; we offer nothing except our heedlessness. Teach us to pray as thou didst pray, so that we may die as thou didst die, with humilty and greatness of soul. 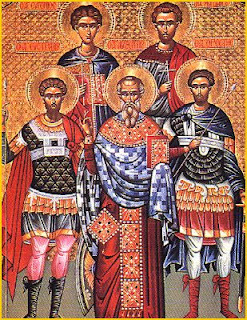 The Holy Martyrs Eustratios, Auxentius, Eugene (Eugenios), Mardarias and Orestes suffered for Christ under the emperor Diocletian (284-305) at Sebasteia, in Armenia. Among those first Christians then undergoing torture then was the presbyter of the Arabian Church, the Martyr Auxentios, locked up in prison. Looking on at the steadfastness of the Christians was the nobleborn military-commander Saint Eustratios, city-governor of the city of Sataleon. He was secretly a Christian, and he decided on an open confession of faith, for which he was subjected to torture: they beat him, put iron sandals on his feet, and burnt at him with fire. And after these cruel torments they burned him, and beheaded the Martyr Auxentios. Witnessing their death by martyrdom, one of the common people, Saint Mardarias, likewise confessed his faith and was suspended upside down. Before death he uttered the prayer: “O Master Lord God, Father Almighty…”, which is read at the end of the 3rd Hour and at the All-Night Vigil. For the Martyr Eugene (Eugenios) they cut out his tongue, they cut off his hands and feet and then they cut off his head with a sword. The young soldier Saint Orestes confessed himself a Christian and for this stood trial. He was sentenced to burning upon a red-hot iron bed, whither he went encouraged by the prayer of Saint Eustratios (“Greatly I do exalt Thee, O Lord…”) which is read at the Saturday All-Night Vigil. The Martyr Eustratios died on 13 December. You may get an icon of the saints here. You are currently browsing the archives for the menaion category.